"Apple's mission is to make products as accessible as possible," said Apple CEO Tim Cook in a statement about the new program. "We created Everyone Can Code because we believe all students deserve an opportunity to learn the language of technology. We hope to bring Everyone Can Code to even more schools around the world serving students with disabilities." Apple collaborated with engineers, educators, and programmers from various accessibility communities to make Everyone Can Code as accessible as possible, and will continue to work with schools to augment the curricula as needed. Apple will provide additional tools and resources such as tactile maps to enhance the understanding of coding environments for non-visual learners. The first round of schools to implement the program are the California School for the Blind, the California School for the Deaf, District 75 in New York, Florida School for the Deaf and the Blind, the Hadley Institute for the Blind and Visually Impaired, the Perkins School for the Blind, the Texas School for the Blind and visually Impaired, and the Texas School for the Deaf. The iPad and Everyone Can Code can also be used by students with physical motor limitations through Apple's built in Switch Control, in conjunction with VoiceOver. The technology enables switches, joysticks and other adaptive devices to control what is on the screen. Apple's Everyone Can Code was designed by Apple engineers in tandem with educators, and is meant to entrench Swift as a platform. Although it can be used on Linux, Swift is mostly Apple-centric, meant to build apps for macOS, iOS, watchOS, and tvOS. 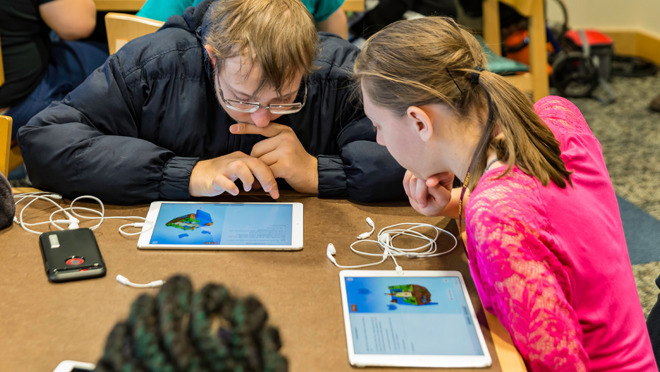 On March 7, Apple held its first session for visually impaired students at the Texas School for the Blind. 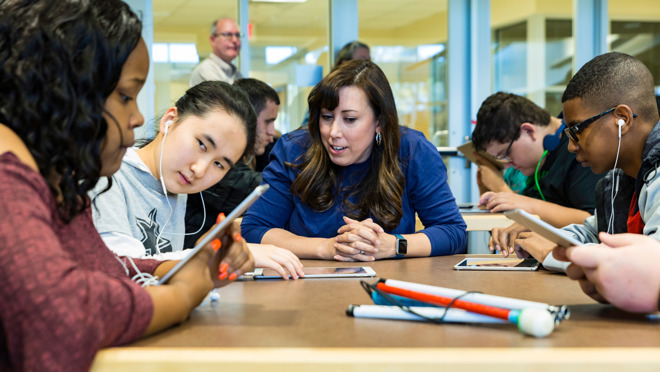 As part of the educational session, a team of Apple engineers led the session, and taught students how to write code on an iPad using iOS accessibility features like VoiceOver.